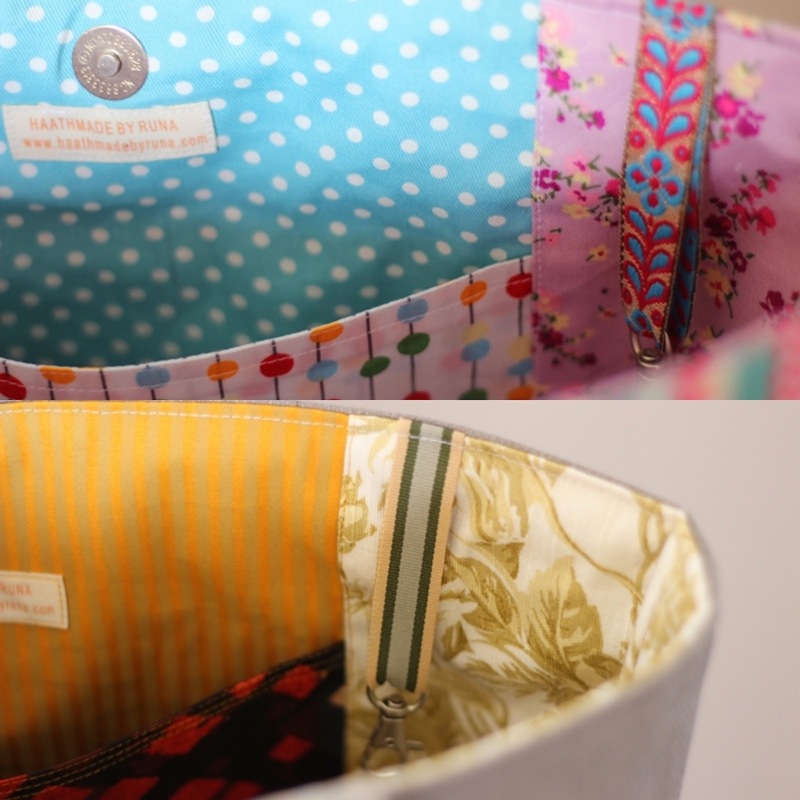 Presenting the neatest and the most organised tote ever! The beauties are what I was looking forward to sharing with you in my last post. These can help you carry around just anything. What really excited me is the structure and size of the tote. Took me a week to get just the various interfacing combinations right and when I did, it didn't bunch up or break a machine needle, but it's surprisingly sturdy and does have a lot of layers to sew through. I can proudly proclaim no needles were broken this time :) Having experimented with different interfacings, it wasn't frustrating to sew though there are quite a few pieces to cut and various fabrics to coordinate. They take a while to finish since it's almost like making 5 bags and then putting them all together. The padding gives these bags a beautiful neat structure as well as strength. They are sturdy and not bulky at the same time. The straps won't tug at your shoulders from the weight and sit just at the right length. The cute flap front pockets add so much fun to the bag, its almost as though they're smiling at you. Snaps keep them nice and tightly shut and can be used for small tiny things that usually end up at the base of big bags. Its just right to store your sunglasses or cell phone etc. 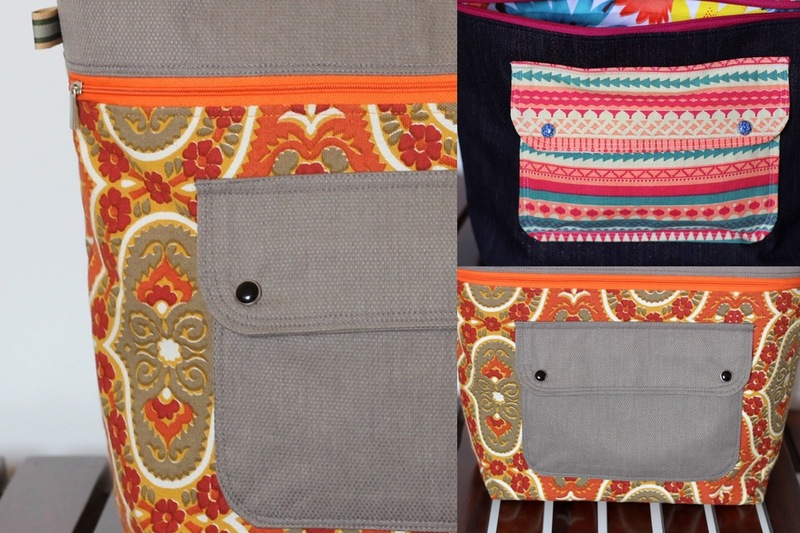 The bigger outer zip pocket is great to store a wallet, iPads, kindles, tablets or eReaders of various sizes. The zip will keep them from falling out and the padded exterior will keep them from getting squashed and damaged. The lining is the most fun part of all. Patchworked and colourful adds tons of prettiness to the bag. 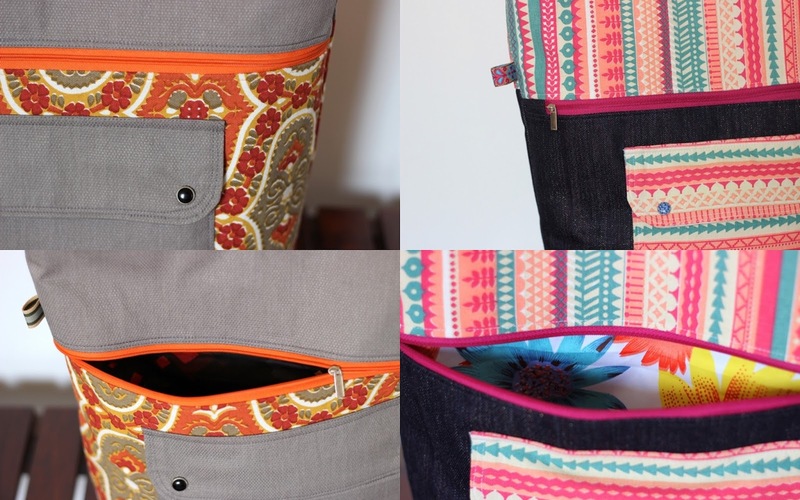 A slip pocket for your tiny cosmetics, loose change etc. The rather spacious interior with a big 5 inch depth can fit in tons. 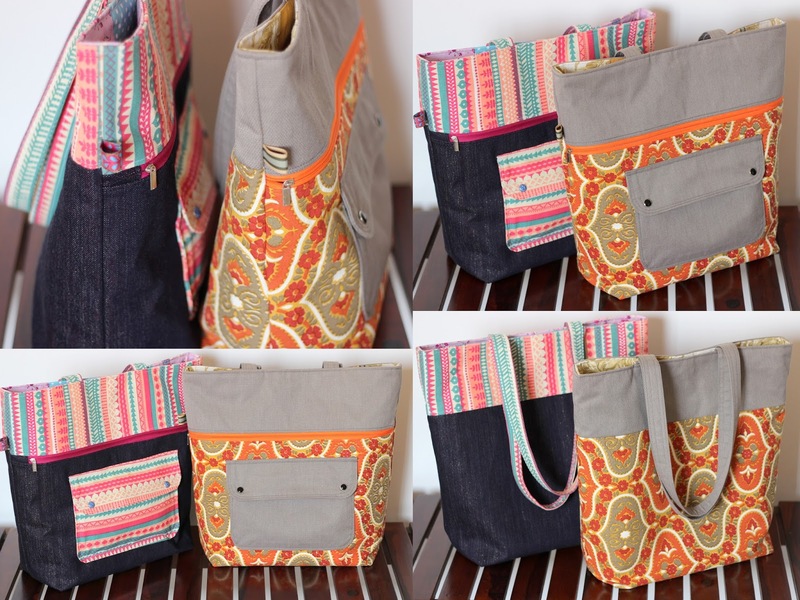 I see this bag as a great weekend bag or a nappy bag for young moms who hate toting around the usual plastic bags. Its big enough to carry a medium sized laptop. My 13 inch Macbook Air fits in rather well with 1 inch room on the sides. I'm definitely making one of these when I go on a holiday next month. Its just the perfect size to carry around at airports plus the magnetic snap on the top keeps the bag closed. 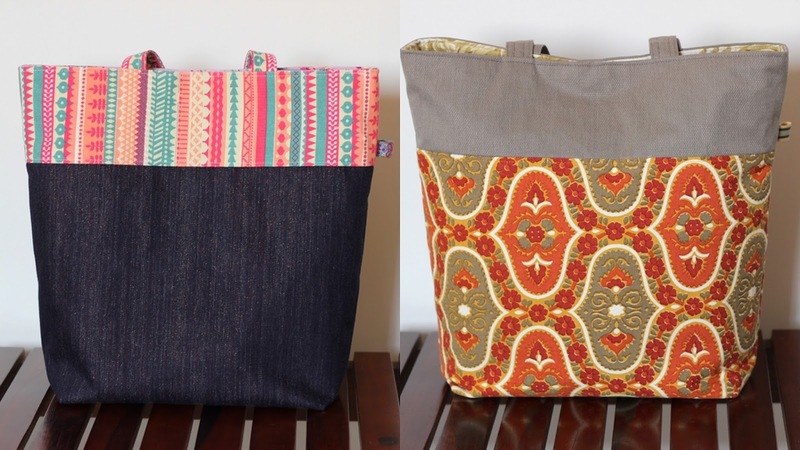 This tote sure is a great way to showcase pretty fabrics. I've used dark denim bought from a local fabric store in Bareilly, printed upholstery weight fabrics from Freedomtree, printed corduroy and cotton prints for the lining. I've put these up in the store for sale. 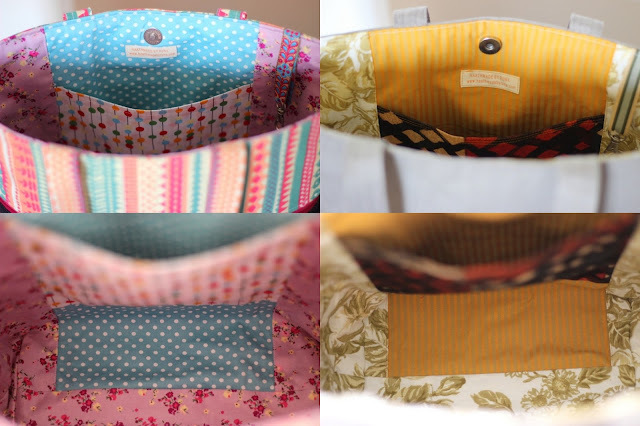 Yes they cost much more than the usual tote bags I make, but that's how much the fabric and detailing cost me. You could click here to buy them. The holiday plans are definitely taking shape. The Schengen visas arrived yesterday afternoon, that's in 3 days flat :) If you live in Bombay and are applying for a visa at the French Embassy, you need not take an appointment and stand in unending queues, just walk in after 8 am with your complete set of papers. 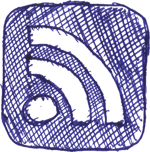 The staff at the numerous counters are extremely patient and helpful. The weather was gorgeous early this morning. It's a pleasure to watch the monsoon skyline of Mumbai. Go and enjoy your Europe trip.I'll be waiting for your write-ups on the trip.